Are you a Shake Shack or an In-N-Out person? Don't cop out and say you're both, because there is no such thing in the EPIC battle between the two mighty and very delicious fast food chains. I'll go ahead and say it myself: I'm on Team Shake Shack. I used to work across from the original location in Madison Square Park, and, on days that were particularly rough (or, if the line happened to be short, lol), I'd treat myself to a cheeseburger, crinkle-cut fries, and, if work was REALLY bad, a milkshake. Although it's been a couple of years since I lived in New York, I still find myself craving Shake Shack regularly (Portland happens to be one of the last places in America that STILL doesn't have a location — what gives!). To curb these cravings, I bought a copy of their cookbook and decided to try and recreate their burgers at home. While I nailed their secret sauce and the perfect sear on my patties, the bread situation was a little lacking. The problem? Martin's Potato Rolls aren't as much of a thing out in the West Coast, and I didn't want to pay a bizzaro amount of money to buy multiple bags online. So I started looking for substitutions: the potato rolls here were far inferior to anything you can buy out east, but there were plenty of Hawaiian sweet rolls to choose from. In particular, I was fond of King's Hawaiian — they had the same light and fluffy texture as my beloved Martin's potato rolls, with just the right amount of chewiness to hold up to any filling. Pretty soon, I was addicted and eating King's even without the burger accoutrements. It never occurred to me that I could easily make them at home until I flipped through my good friend Alana's new cookbook, Aloha Kitchen. 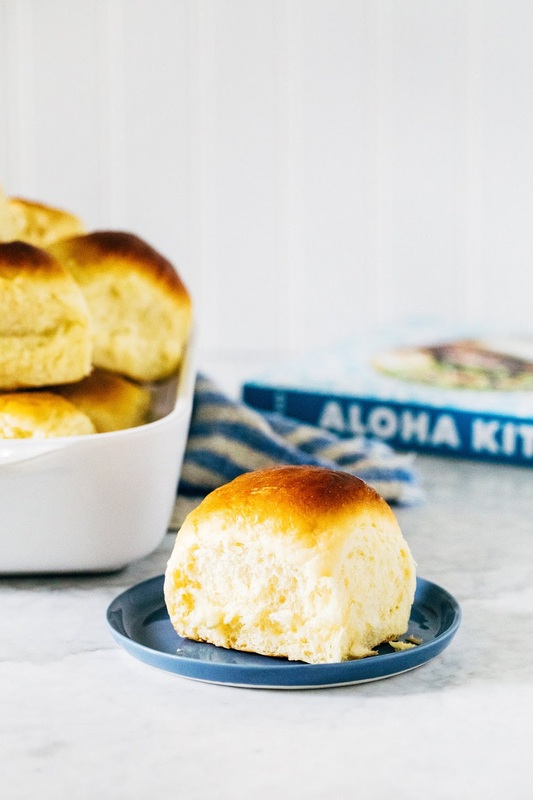 Aloha Kitchen is all about Hawaiian cuisine and its many influences from all around the world — for instance, these Hawaiian sweet bread rolls are actually based on pão doce, a sweet bread from Portugal. 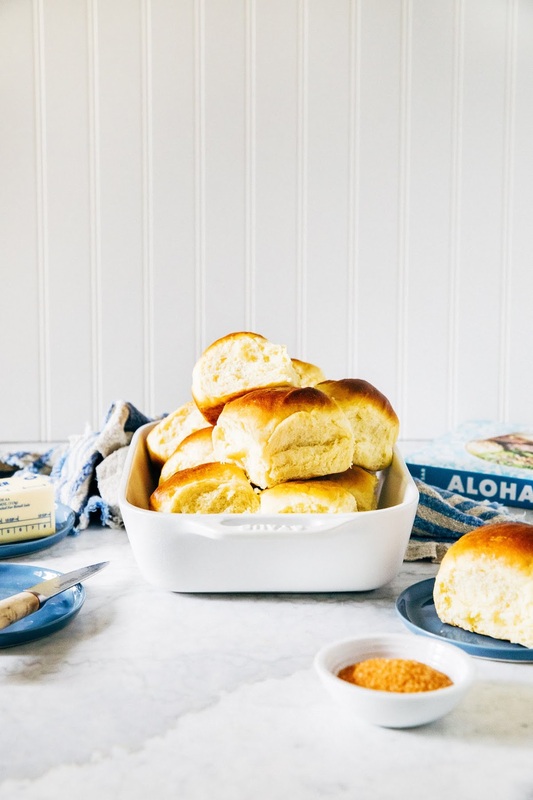 Alana's version pays homage to my beloved King's Hawaiian rolls, but also notes that every island has its own local sweet bread spot. Confession: I've never actually been to Hawai'i (except for a brief stopover when I was flying from Portland to Manila — I don't think that counts). But Alana's book really transported me there; it's filled with beautiful images of the island, with recipes, stories, and even history lessons. Never has a cookbook given me such a complete sense of place. 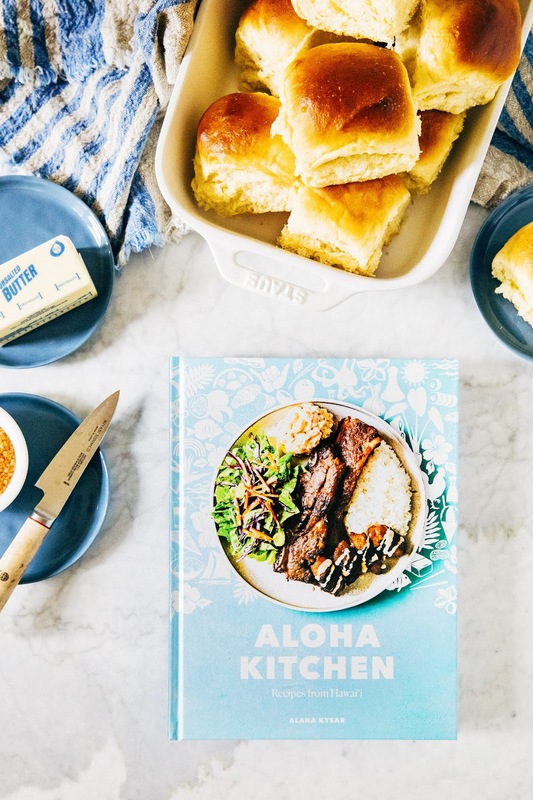 I'm especially proud of Alana because she started the cookbook process a few months before I did — I see her years of hard work on every page, and hear her warm voice and deep passion for her home in every word of Aloha Kitchen. Her book is an incredible accomplishment beyond what I can describe here, so be sure to check it out for yourself! 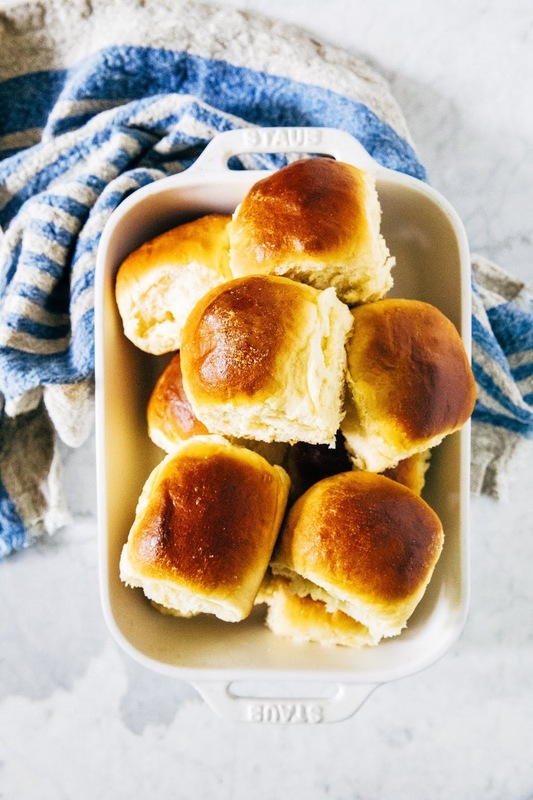 Although Alana's version has you make and bake the rolls in one day, I split the recipe over two days to make an overnight version to cut down the time I spent waiting in the kitchen. To expedite the process and make the rolls all in one day, skip chilling the dough in the fridge overnight and instead let the dough rise in a warm spot until doubled in size, about 1 1/2 to 2 hours. Proceed with the rest of the instructions on Day 2 as instructed. To roll the dough into balls, I use the pinch and claw grip as taught by this video and the Bread Ahead cookbook's method for shaping donuts. The video will explain it much better, but you basically fold the seams of the dough inwards to make a rough ball shape, then use your hand in a claw shape to roll the dough into a perfect circle. If that didn't make any sense, just watch the video, lol. Day 1: Make the Dough! In a medium bowl, whisk together 2 3/4 cup (12.35 ounces) of the bread flour, 3 tablespoons potato flour, and 1 teaspoon kosher salt and set aside. Remove the bowl of your stand mixer and combine the remaining 1/2 cup (2.25 ounces) bread flour with 4 1/2 teaspoons active dry yeast and 1/3 cup warm water, mixing until it comes together and most of the dry bits are incorporated — it's okay if it looks a little dry. Let the mixture rest for 45 minutes at room temperature, uncovered. Return to your stand mixer bowl and fit it to the stand mixer along with the paddle attachment. Turn the speed to low and add 1/4 cup warm milk, 1/2 cup sugar, 2 large eggs, 1 large egg yolk, 1 teaspoon vanilla, and 6 tablespoons butter in that order. Mix until well combined, about 2 minutes. Turn off the mixer and change the attachment to the dough hook, scraping the paddle attachment clean. Turn the speed to low and add the dry ingredients, slowly increasing the speed to medium. Once combined, knead the dough on medium speed until the dough is smooth, about 5 minutes. Turn the dough out onto a clean surface and form into a ball. Clean the bowl and coat it lightly with neutral oil. Place the dough back in the bowl, turning once to coat both sides. Cover the bowl with plastic wrap and refrigerate overnight. Day 2: Shape and Bake the Rolls! Lightly grease a 9 by 13-inch baking pan with neutral oil. Punch down the dough and divide it into twelve equal pieces. Roll each piece into a ball, each around 2.60 ounces, and evenly space them in the pan. Cover the pan with lightly greased plastic wrap and let rise until doubled and puffy, about 1 to 1 1/2 hours. Halfway through the rise time, position a rack in center of the oven and preheat to 350 (F). In a small bowl, make the egg wash: whisk together 1 large egg white and 1 teaspoon water. Brush the top of each roll with egg wash and bake for 20 to 25 minutes, until browned. An instant thermometer inserted into the middle of a roll should read 190 (F). Let cool in the pan on a wire rack for 5 minutes, then turn the rolls out onto the wire rack. Serve warm. 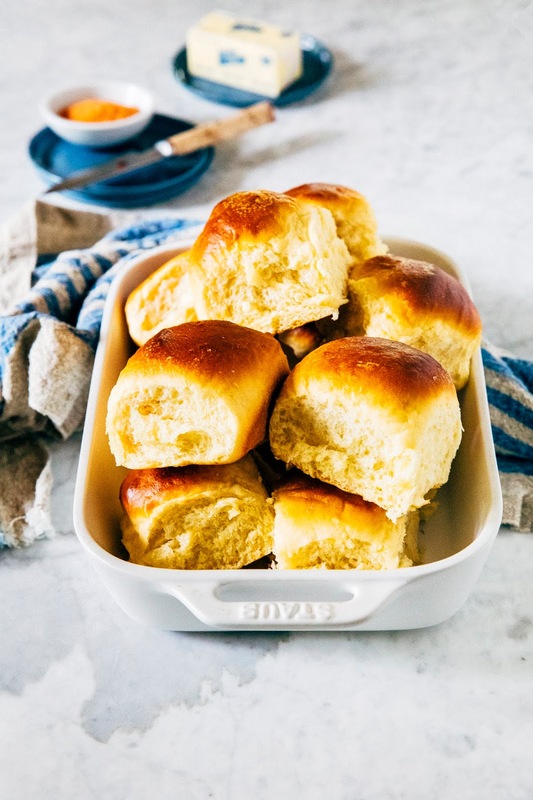 Leftover rolls can be stored in an airtight container at room temperature for 3 to 4 days.